On Saturday we took a road trip from Patzcuaro to some of the more remote villages where life is still very traditional. One of the towns we visited was Nureo. 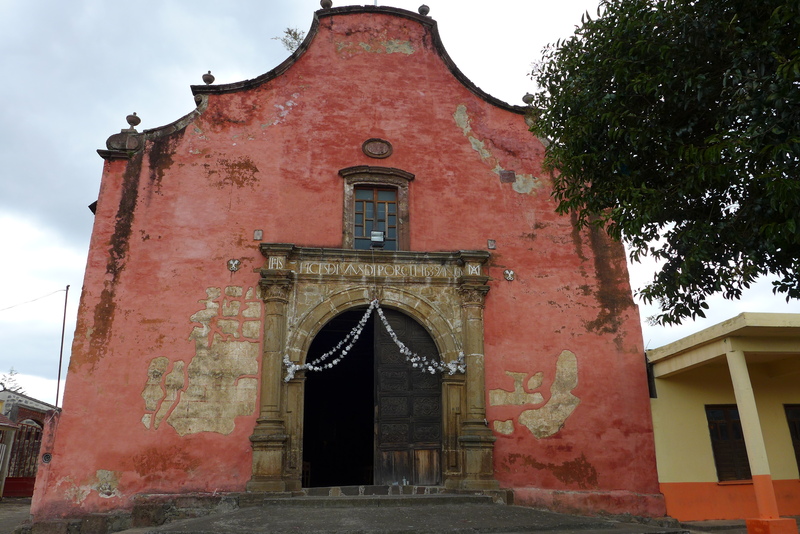 We stopped in the central square with the idea of visiting the beautiful Purhepechas church famous for its pink exterior. There was a service in progress and we soon realized that it was a funeral. So of course we were unable to go into the church. However, there was a festival in the square and I in particular was interested in the costumes worn by the women. The traditional clothing consists of an embroidered slip, pleated skirt of synthetic material, one or two back strap woven belts, an embroidered blouse, over blouse, reboso and delantal (apron). These delantals are cross stitched and some take as long as three months to embroider. The embroidered blouse is generally a floral pattern but geometric designs can also be seen. The fashion changes quite quickly they told us shyly, smiling with their hands covering their face. Recently the aprons have been made from Indian bling fabric and trust me some of them were quite dramatic. Then again I saw some garments so heavily stitched with cross stitch that it must have been quite uncomfortable to wear. The most talented band played through the funeral service and one young man bought food over to share with us after the service was over. Tagged with: color, Purhepechas Embroidery, Travel. Interesting to see that they are cross stitching on Aida cloth. This must be available everywhere in the world. I see that the Hmong in Laos have moved their stitching onto the same cloth. It certainly makes counting the stitches easier and is usually made out of 100% cotton so will wash well. But who is the sales person who is getting this fabric to these out of the way places?